We arrive at Nivati Fort bus stop, park the bike and head to the beach. The bus stop is about 80-100 feet above the sea level so one has to walk down a slope to the beach. 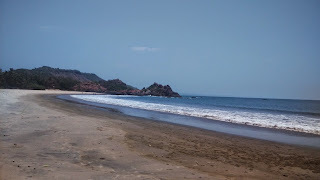 The beach is a dual beach, the northern and southern sections separated by the Nivati Golden rock - called such because the composing rocks apparently tend to glow during sunrise. The southern beach was the one seen by Tejal from the boat. This section can only be approached after wading through thigh deep water. So, we head to the northern section. The beach is small and cute and with calm welcoming waters. However there is some algae in the water so we don't go in. There are some rocks with shade at the far end. We have a seat here with a very good view. We finally decide to have the little hearts. From now on we decide to rate beaches by little hearts. This one gets 3.5 out of a possible 5. We head to the Golden Rock. There's a pathway that we can see from our seat. We think that it might lead us to the southern side. We ascend the rock. Its a steep fall on the other side, but the view is simply magnificent. Clean turquoise blue waters, a white strip of sand, idling waves and a smallish lagoon. We rate the beach 4/5 hearts. We descend from the rock to the northern face and head to the bike. A mad-ish dog is tethered next to the parking area. It thrashes around to free itself. Nearly succeeds. We inform some local people. The locals seem to take no notice of the dog. We flee from there. Its back to Mhapan for lunch. We leave from Mhapan. We have to reach Sawantwadi by 1630 hrs. We decide to use the Parule-Kudal-Sawantwadi route rather than the Vengurla road. This is a better road - better quality, less inclines and less curves - and hence faster. 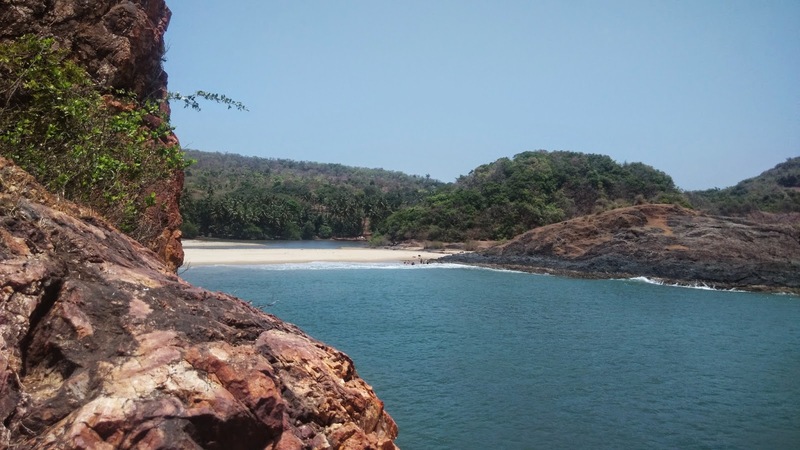 We reach Pinguli, bypass Kudal and head to Sawantwadi through the Goa highway. We take a watermelon break once on the highway. It seems the fuel would barely last us till Sawantwadi. We decide to fuel up a little ahead. We are back to hotel Viva Konkan from where the action started yesterday. We have refuelled at a new petrol pump opposite to the hotel. It took some amount of convincing to get fuel worth Rs 30. The attendant was adamant on Rs 50 minimum value. We have some time to freshen up, which we do. We call up the bike owner to ask if he can collect the bike at Sawantwadi station. He readily agrees. Well, we just saved at least half an hour worth of the bike ride and a round about of at least 15km. We leave for the station. There are no signboards so we ask our way around. We reach the Sawantwadi Station. There's still an hour for the train to arrive. We relax our bike-sore-bums. We pick a little snacks. 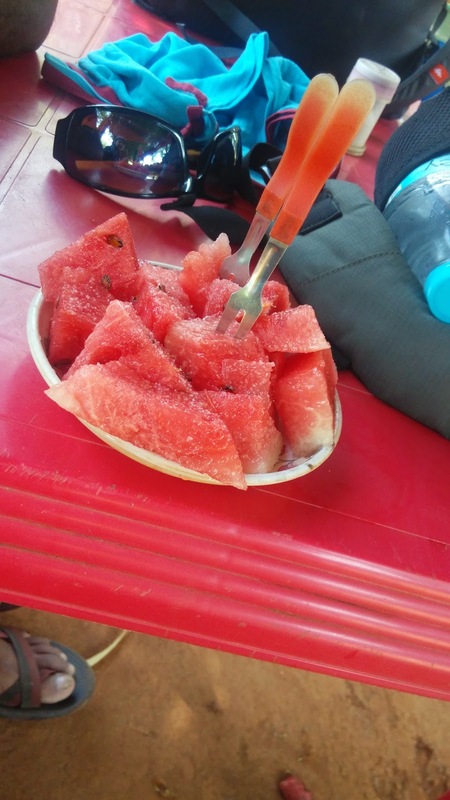 We wanted fruits, but the station has no fruit vendor. We while our time away.